We all know it’s not safe to text and drive. In fact, Miss Toadd, the Queen of Mobile Phone Land, has issued a decree against it. 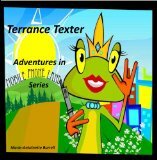 But one day Terrance Texter ignores the rules and runs right through the land, not noticing the obstacles in his path. In a land where everyone has a cell phone, caution must be used when operating cars and machinery. And a warning is given to use texting, tweeting and facebook status updates wisely, since inappropriate messaging can have dire consequences. Terrance Texter is a nicely illustrated rhyme, but I struggled with the intended age group for this book. While the story preaches to young children, I don’t know how effective the “don’t text and drive” message will be in reaching them. They will have long forgotten a childhood book by the time they receive their driver’s licenses.